Bryant rooftop unit durability No matter which size or model will best suit your application, you can count on the lasting durability of our tough, galvanized steel cabinets. The roll-formed base rail design features forklift slots and rigging holes for easy maneuvering during transport while providing strength and stability for rooftop placement by crane. The base rail also provides a built-in base for horizontal applications. Inside the unit, our standard aluminized steel or optional stainless steel, corrosion-resistant heat exchanger and coils provide additional assurance for lasting indoor comfort. Bryant adaptability Units are shipped in the vertical discharge airflow configuration for installation with standard roof curbs. Four curb sizes for the entire 3-25 ton size range allow the contractor to order and install the roof curb before size requirements are final. For horizontal installations, the 3-12.5 ton units can be field converted quickly and easily. To better match your building needs, Bryant offers a wide range of factory-installed options and accessories. They include fully modulating gear-driven economizers, high-static motors, a non-fused disconnect switch, 115-V convenience outlet, hinged panels and coil protection guards. Bryant’s exclusive Perfect Humidity™ dehumidification coil option features a sub-cooling mode and a hot gas reheat mode to deliver neutral air when the space temperature is satisfied but the space humidity is high. It is a total package of comfort, built and backed by the most trusted name in indoor comfort: Bryant. Warranty Bryant’s packaged systems provide reliable comfort backed by written warranty protection. 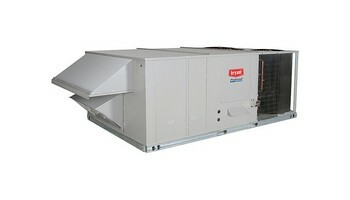 The compressor is covered by a five-year limited warranty (036-180, 3-15 tons). All models are covered by a one-year limited warranty on the entire unit. Extended warranties are also available. Bryant rooftop systems uses control technology to increase the energy efficiency and reliability of rooftop units while increasing the flexibility of your control. An advanced, free cooling changeover strategy allows you to take advantage of outside air during cooling cycles. The high-performance damper system features a gear drive (no linkage to bend and disable operation) and heavy-gauge steel construction. The direct mount actuator is tested to withstand millions of repositions for maximum reliability. The bryant rooftop unit system standard outdoor temperature sensor provides accurate sensing of available free cooling and mechanical cooling lockout. Low pressure drop characteristics of the mixed air damper eliminate the need for a high-static fan. And, the integrated barometric damper results in greater natural relief of building pressurization. The secret to the EconoMi$er’s high performance is an easy-to-set-up solid state controller that delivers accurate, reliable and repeatable control for maximum savings. The EconoMi$er is designed for new construction or retrofit applications, and is available for factory or field installation.